Private beach on one of the most beautiful lakes in the region, on a huge lot, without neighbors, crossed by a stream that shaped its bed in the rock of the mountain, the chalet Le Canyon throne, surrounded by majestic trees. Unique in its architecture, the chalet offers a memorable stay experience with its open spaces, its abundant windows and its watchtower. 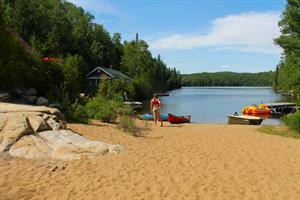 The cottage is located on a private estate crossed by a cascading river over 1km with forest trails and private beach.